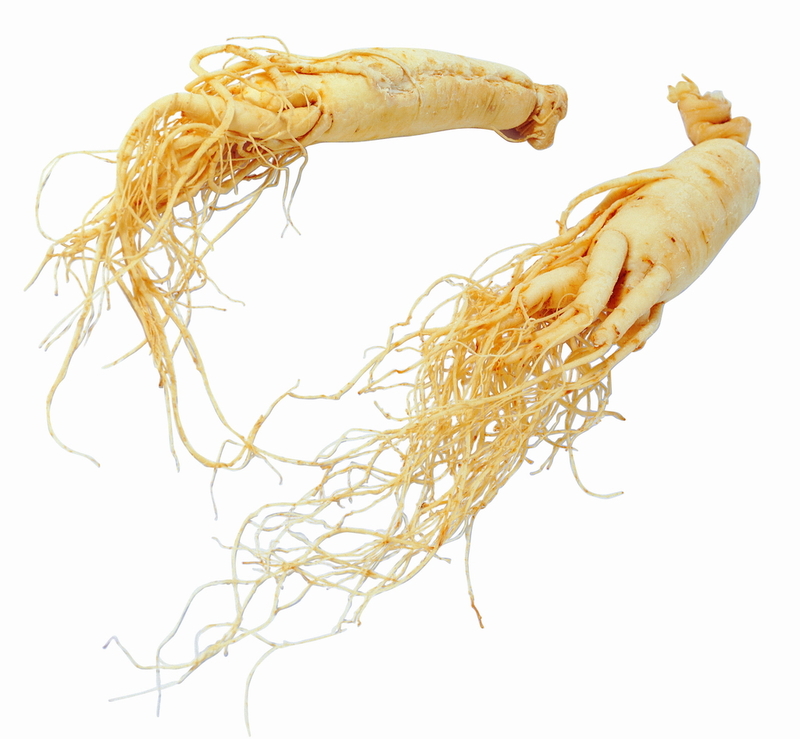 The root of the perennial herbaceous plant Panax ginseng C. A. Mey. of the family Araliaceae. Mainly produced in Jiling, Liaoning and Heilongjiang provinces in China. Called the wild Shan Shen, called the cultivated Yuan Shen. After 6~7 years cultivation, plucked the root in autumn when stalk and leaves wither. The sun-dried raw Ren Shen is called Sheng Sai Shen and the dried after being steamed is Hong Shen. Specially fragrant, sweet and slightly bitter taste. Coarse, firm, complete, thin lines, long reed. Sweet, slightly warm; spleen, lung and heart meridians entered. Powerfully reinforce original qi, tonify zang-organ qi, promote the generation of body fluid to alleviate thirst, and induce-tranquilization mind and improve the intelligence, nourish blood. It is the most important herb in treating exhaustion syndrome because it powerfully reinforces original qi. For qi-exhaustion accompanied with extremely faint pulse tending to cease caused by heavily sweating, severe vomiting and diarrhea, or long and severe diseases, it can be used singly in large dosage, like Du Shen Tang in Jing Yue Quan Shu. For qi-exhaustion with some symptoms of yang-exhaustion, such as sweating, cold extremities, it is combined with other yang-restoring and collapse-rescuing herbs, such as Fu Zi in Shen Fu Tang recorded from Zheng Zhi Lei Yao (Classified treatment principles). For qi-exhaustion with some yin-exhaustion symptoms, such as sweating but warm body, thirst and desire for cold drink, dry and red tongue, etc. Though Ren Shen can promote generation of body fluid, it is combined with yin-nourishing herbs to promote the generation of body fluid and astringe sweat, for instance, it is used with Mai Dong and Wu Wei Zi in Shen Mai San from Nei Wai Shang Bian Huo Lun. This herb is adept in tonifying spleen-qi, it is indicated for fatigue and mental fatigue, poor appetite and loose stool, or other symptoms caused by spleen-qi deficiency. It is often combined with spleen-tonifying herbs to dry the dampness or induce diuresis. For instance, it is used with Bai Zhu, Fu Ling in Si Jun Zi Tang from He Ji Ju Fang. For long-term diarrhea, proctoptosis, or ptosis of internal organs caused by sinking qi of middle energizer due to spleen qi deficiency, it is combined with qi tonics and yang-raising herbs. For instance, it is used with Huang Qi and Sheng Ma in Bu Zhong Yi Qi Tang from Pi Wei Lun. This herb has the action of keeping the blood flowing in the vessels through tonifying qi and it can be indicated for spleen qi deficiency with bleeding. It is often used with Huang Qi and Bai Zhu, as in Gui Pi Tang from Ji Sheng Fang. This herb is also skilled in tonifying lung-qi. It is combined with herbs for relieving cough and dyspnea or tonifying lung-qi, and indicated for shortness of breath, dyspnea, no desire for talking or other symptoms due to lung-qi deficiency. For instance, it is used with Wu Wei Zi, Su Zi in Bu Fei Tang from Qian Jin Fang. Ren Shen has the action of tonifying both lung qi and kidney qi, thus it is indicated for dyspnea of deficiency type caused by lung qi deficiency and failure of kidney to receive qi absorption due to deficiency of lung and kidney qi. It is usually combined with herbs for tonifying lung and kidney so as to improve qi reception to relieve dyspnea. For instance, it is combined with Ge Jie or Hu Tao Ren respectively in Ren Shen Ge Jie San from Wei Sheng Bao Jian, or Ren Shen Hu Tao Tang from Ji Sheng Fang. This herb has the action of invigorating qi and promoting the generation of body fluid, it is indicated for thirst caused by both qi and body fluid injury during heat diseases or both qi and yin deficiency. For thirst and bit but weak pulse caused by both qi and yin injury during heat diseases, it is often combined with heat-clearing and fire-purging herbs. For instance, it is used with Zhi Mu, Shi Gao in Bai Hu Jia Ren Shen Tang from Shang Han Lun. For thirst, dry throat, fatigue and shortness of breath caused by both qi and yin deficiency, it is often combined with yin-nourishing herbs to promote the generation of body fluid, like in Sheng Mai San from Nei Wai Shang Bian Huo Lun. Commonly, the differentiation of diabetes shows as the fundamental aspect of the disease is yin deficiency, the incidental aspect of the disease is dry heat, and accompanied with qi and yin deficiency. Ren Shen can treat diabetes singly for it can both tonify qi and relieve thirst by nourishing yin. In clinic, for enhancing the effect, it is often combined with thirst-relieving and yin-nourishing and body-fluid generating herbs, such as Sheng Di Huang, Tian Hua Fen. Because this herb can not only produce blood through tonifying qi but also can promote the generation of blood directly, it is indicated for blood deficiency syndrome, especially for deficiency of both qi and blood caused by qi deficiency failing to generate blood. It is often used with herbs that tonify qi and nourish blood. For instance, it is used with Dang Gui in Shen Gui Tang from Jing Yue Quan Shu for blood deficiency syndrome, and combined with Bai Zhu and Dang Gui in Ba Zhen Tang from Zheng Ti Lei Yao for both qi and blood deficiency. This herb has the action of tonifying heart qi and induce tranquilization mind and improving the intelligence, so it is indicated for diseases caused by heart-qi deficiency or blood deficiency failing to nourish heart. For palpitation, knotted or intermitent pulse caused by heart-qi deficiency, it is often combined with heart-nourishing and tranquilization-inducing herbs, for instance, it is used with Suan Zao Ren, Bai Zi Ren in Zhi Gan Cao Tang from Shang Han Lun, or in Tian Wang Bu Xin Dan from She Sheng Mi Pou. In addition, Ren Shen can tonify kidney-qi and can be indicated for impotence, serninal emission and other diseases due to kidney-qi deficiency. Ren Shen is usually administrated with pathogens-expelling herbs to enhance resistance in order to obtain the effect of tonifying healthy qi and expelling pathogens. For invasion of external pathogens due to qi deficiency, it is combined with the exterior-releasing herbs, such as Ren Shen Bai Du San from He Ji Ju Fang; and for accumulated internal heat pathogen with qi and blood deficiency, it is combined with downward-draining herbs, as in Huang Long Tang from Shang Han Liu Shu. Decoct 5~10 g; 10~30 g can be used to rescue the exhaustion syndrome due to qi deficiency. Be smashed into powder, 0.5~1 g taken each time, twice a day. It can be decocted alone or mixed with other herbal tea by slow fire. Antagonizing to Li Lu; the warm nature of sun-dried raw Ren Shen is weaker than that of Hong Shen.